This product is a time saver for when grading On-Demand Assessments for Teacher's College. 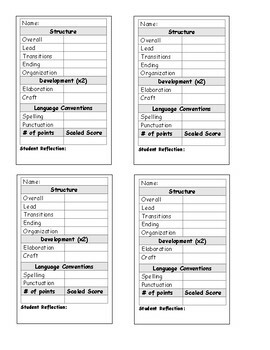 Each rectangle contains all 9 categories of the Teacher's College Rubric, and a spot to put the student's grade next to each category. On the bottom, there is a section for the total number of points and the scaled score. There is even a portion for the students to write a reflection on their work. This product contains the printable PDF.